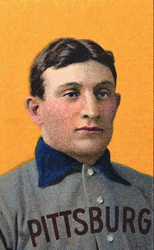 The T206 Honus Wagner is the most famous baseball card in the world. Bought and sold many times over, the card has now appreciated to nearly $3 million dollars. But, this gem may have been doctored. From mere speculation, the accusations of alteration have risen all the way to federal indictments. But this is still 'just' a baseball card. It is a small square in the tapestry of our national pastime. And, as the art world readily illustrates, it may be that no matter what was done or not done to 'The Card,' its value really does lie in the eye of the beholder. A graduate of Georgetown University, Colin Barnicle worked for the Boston Red Sox before moving on to "Late Night with Jimmy Fallon" and later "The Today Show" for the Vancouver Winter Olympics. He now lives in New York City and is a regular contributor to the Huffington Post. Prior to founding Prospect, Nick Barnicle worked for several HBO programs: "David Milch," "In Treatment" and "The Neistat Brothers." He received his B.A. in English from Georgetown University and has also studied at the Fine Arts Work Center in Provincetown, Mass., and the Villa Le Balze in Florence, Italy.